It's day two of my week-long A Smoothie A Day series. Today's smoothie is one of my personal favorites. Sometimes, I even add these to popsicles sticks and freeze them for a healthy and delicious treat. If this summer is anything like the last, I suspect this will be my go-to summer recipe. This recipes includes one of my new favorite secret ingredients-- ginger. In addition to giving your foods a burst of spicy flavor, ginger is great for upset stomachs (goodbye morning sickness), it has been shown to help improve mobility and function for those suffering from osteoarthritis or rheumatoid arthritis, and one of the main components of ginger, gingerols, helps to stop the growth of certain caner cells. Basically I add it to everything--smoothies, stir fry, ice-cream...well, maybe not the ice-cream, but you get my point. 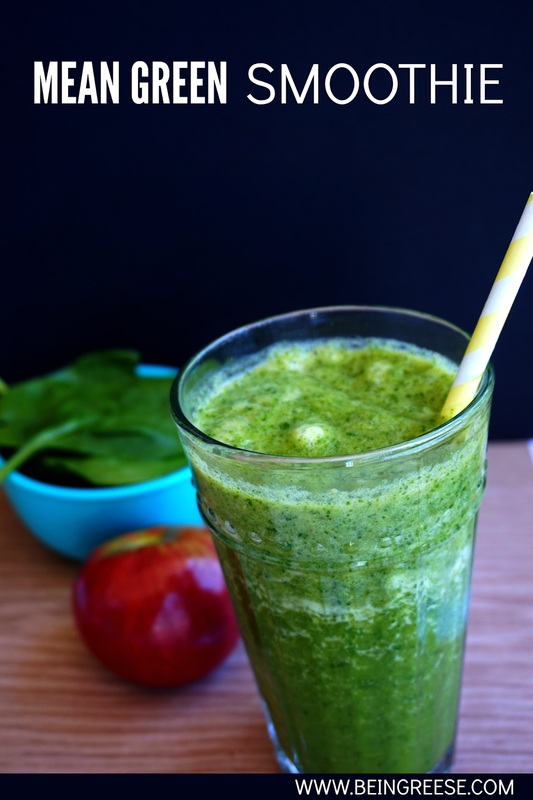 Here's what you need for this tasty green smoothie. Wash spinach thoroughly. Add all ingredients to blender. Blend well. Add ice as needed. Serve with a smile. Be sure to enter into the giveaway below for a chance to win a $50 Earth Fare gift card. Just think of all the fruits and veggies you can purchase with that gift card. Happy Monday! It’s my first official week back in my space, and I’ve got to say, it feels as though I’m saying hello to a long lost friend. As promised, today I’m officially re-launching. 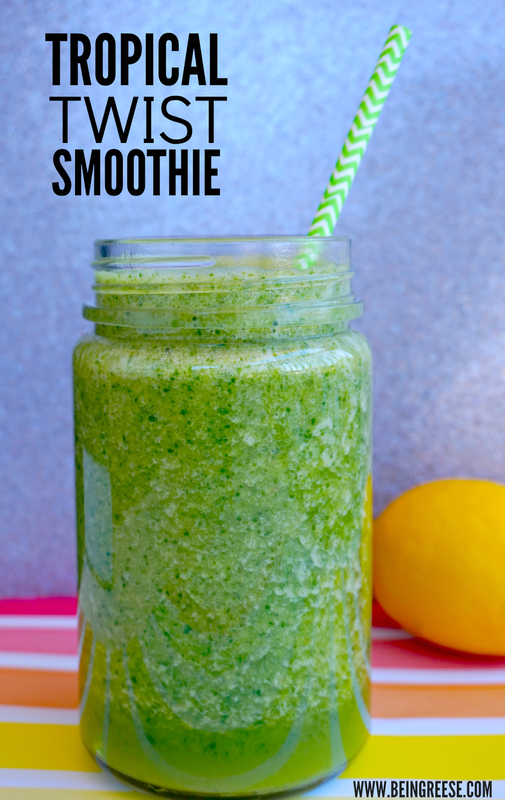 Now that the weather is finally heating up, I’m celebrating by sharing a new smoothie recipe every day this week. I’m also hosting a welcome back giveaway for a $50 gift card to Earth Fare. Monday’s have long since been my least favorite day of the week. After a weekend of relaxing and unwinding, it can be hard to get back into the swing of the things. This first smoothie will fix that. Mean Green Monday packs a powerful punch that will give you the energy you need to get through the day. I like to drink this smoothie early in the morning. It's light, filling and gives me everything I need to make it through Monday. This is also a great breakfast juice. As with all smoothies, it’s important that you properly wash all your ingredients. Kale is especially difficult to clean, so you may want to soak them for 10-15 minutes to ensure that you've removed all the dirt. Toss everything in the blender. (Note: I like to add ice for a more refreshing drink.) Blend well. Serve in glass with plenty of ice. Enjoy! Don't forget to enter into the giveaway below to win a $50 gift card to Earth Fare. This giveaway is only open to U.S. Residents who are 18 years or older. Giveaway ends Monday, April 6th. Good luck! Five months, fourteen days, and three hours. That’s how long I’ve been away. I wish I could say that in my absence I discovered the cure to cancer, or scaled Manchu Picchu. Truthfully, in my time away, I haven’t done anything nearly that dramatic, or lifesaving. Mostly I’ve been trying to find a way to juggle motherhood, relationships, work and life, with an emphasis on the later. If you follow me on Instagram, you may have seen my post a few weeks back about my job. It’s pretty amazing how quickly my role has grown in the year that I’ve been with this company. When I initially began, I was clocking an average of 10 hours a week. Flash forward one year and I’m averaging 30-40 hours a week, and as of last month, I’m managing my own little team. It’s been a crazy-beautiful-hectic journey to say the least. But for the better part of my hiatus from my blog, I’ve felt like something has been missing. Try as I may, it’s impossible to explain blogging to someone who isn’t a part of this community. I can’t explain the feeling of my fingers moving across my keyboard in that old familiar way. I can’t explain the feeling of leaving my comfort zone and baring my soul to the world. I certainly can’t describe the feeling that courses through my body as I read an email from a stranger who takes the time to tell me how comforting my words are. I suppose humbled would be the appropriate word. I’m absolutely humbled that in my absence from this blog you guys have still allowed me to be part of your lives. I’ve got so much planned for you all in the coming months. 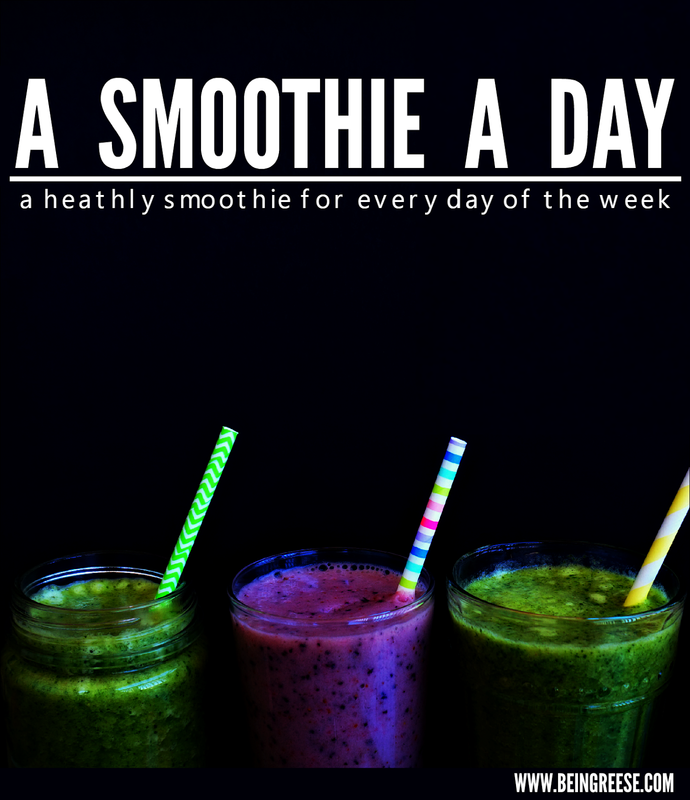 Starting tomorrow, I’ll be kicking off my re-launch with a deliciously new one week series call A Smoothie A Day. This summer I’m committing myself to getting myself in the best shape of my life. I’ve been an avid smoothie and juicer for the past year, but in the coming weeks I’m going to kick it up a notch. I hope you’ll all join me. As promised, I have another special gift for you all. Last week, I was lucky enough to go behind-the-scenes of the brand new Earth Fare in Morrisville, North Carolina. It was a wonderful and informative experience. A big part of my new health journey will revolve around finding foods that contain healthy, natural ingredients, and from what I’ve seen, Earth Fare has this in spades. Because they’re so awesome, Earth Fare has agreed to give one of my lovely readers a $50 gift card. Come back tomorrow the first delicious smoothie of the week and a chance to win that gift card!